I recently shared with you diapering mishaps and how to avoid them, today I am going to share with you the 3 stations every new mom needs in their home. Bringing a newborn home can be overwhelming, let’s break it down so that your home is a place of peace for you. 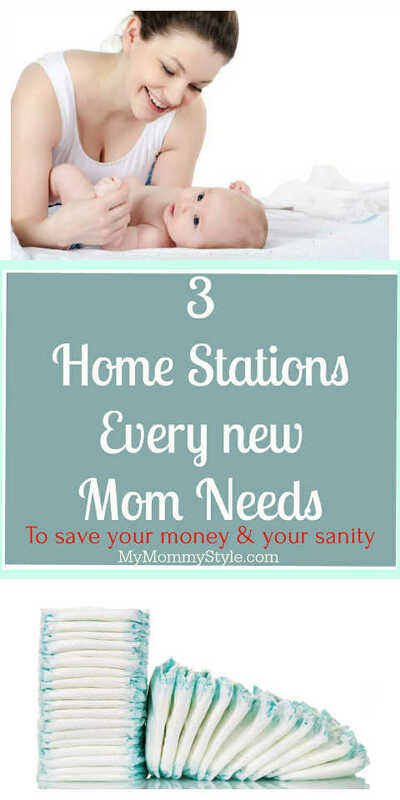 I have found that having stations in your home can cut down on the stress of every day life. Diapering is a very full part of every day motherhood, here are a few things that has helped me with the inevitable changes that come! Newborn: When your baby is really small it is nice to have a diaper station in at least 3 areas of your home. For me, this was next to my bed, (while my baby was sleeping in a pack n play next to me), in the nursery, and in the main living space that I spend a good amount of my day. Each station should have your essentials, diapers, wipes, diaper cream, and extra supplies. The extra supplies could be an extra onesie, sleeper, burp cloth, or washcloth. If it is too much for you to set up different “Stations” consider creating a basket or tote that you can bring around different areas of the house with you. Another clever area that can work well is having a diapering station in the kitchen if you have a butlers pantry area or nook that would work well. You can define the space with a changing bad and keep the supplies in the cupboard above or below the counter-space. Stocking up while prices are low will save your money and your sanity. Consider your house, your car, your stroller, diaper bag, and places that you often spend your time outside of the home. Using subscription services that keep a regular schedule of diapers/wipes/snacks coming in will save you from last minute or late night trips to get the essentials you need. I love ordering products that I need online that are a consistent need so that I can avoid impulse buying and I know that I will never be without the essentials. Sam’s Club wants to support new moms and is giving away 25 $100 Sam’s Plus Gift of Membership Gift Cards! You can also take advantage of additional coupons here. Be sure to check out all the different membership options available at Sam’s Club. The Plus membership will give you $10 off every $500 you spend. Save a ton of time with Club Pickup. Search for a store that offers this service near you, and you’ll be able to order all your groceries online, and pick them up easily through a curbside pickup or drive through. Take advantage of cashback deals when you’re accepted for a Sam’s Club MasterCard. You’ll earn 5% back on gas, 3% on dining and travel, and 1% on everything else! Skip the checkout lines with Scan & Go, order ahead with Club Pickup or shop on the go with the Sam’s Club app. Sign up for a new membership, they’ll receive a $20 gift card, as well as $25 in new member Instant Savings. I am not referring to the gaming console…ha ha. Your baby’s stage of life will dictate what this station looks like, but I have found that it will save your sanity if you decide how much space you have to dedicate to the playing zone and stick to it. I like to keep a toy bin in the family area that I can switch out a few of my baby’s favorite toys. The rest are kept in a play room. I have to clear out and rotate this area fairly often, but I find it most helpful if you don’t let the area explode. Every night I do a clean sweep and use a large laundry basket to pick up all of the extra things that end up on the floor. If your bin is overflowing it is time to locate the items somewhere new or rotate the toys your child is playing with. As your children get older they can help with the clean sweep. It can be a lot of fun if you set a timer for 5, 10, or 15 minutes and do your last clean sweep before everyone gets ready for bed. What should a play station have in it? Studies have shown that our child’s minds will benefit most from toys or activities that engage the mind and the senses in different ways. I like to keep it simple with blocks, imaginext figures, little people, and shape sorters. You can see a list of my favorite baby toys and sleep sacks here. Setting up different sleep stations for your baby through out their lives can be a really nice way to develop healthy sleep patterns and comfort. The most important thing you can do you and your baby is to develop healthy sleep patterns. I have found it most convenient to have a sleep area in my room that is close and safe, but in the first few months I will also set up a sleep station in a main living area or nursery. I really like the rock n play, pack n play, or little bouncers that make moving your baby around with you convenient and safe. Make sure your area is free of large comforters, stuffed animals, or other items that present a choking hazard. If you are wanting to invest in more surety you can buy an owlet that monitors your baby’s vitals all night long! If you are on Twitter please join the twitter party for your chance to win Sam’s Club gift cards! RSVP for and join the #NewMomsLoveSams Twitter party on November 6th, during which we’ll be giving away $1500 in memberships. The RSVP page can be found here! Thursday, November 1st at 12:00 AM ET to Friday, November 9th at 11:59 PM ET. The winners will be chosen through a lottery drawing and notified on Monday (11/12) via the email address they used to enter.